Getting the paper at your local newsagent is not as difficult as it may appear, says Bernadette Keaveney. In the last month I have been in the happy postion of receiving daily enquiries asking where can the Morning Star be purchased. The publicity we received during the final weekend of the Labour Party election, together with our editor Ben Chacko appearing on various radio and TV news programmes lifted our profile. We’ve always known that there is a market for our publication but reaching it and advertising our existence has always been a great challenge. The simple answer to the enquiry is that any retailer that sells newspapers is able to obtain the Morning Star through their usual wholesaler. It should take no more than 48 hours for a regular delivery to commence and there is no risk to the retailer in stocking our title as we are fully sale or return, the same as all other national newspapers. Why are we not more widely available in shops? There are over 50,000 retailers selling newspapers each day. We cannot afford the print run to supply all of them and the sales volume of our title does not make us an attractive proposition for many — especially those which like supermarkets work out profit on space margins. Unless we are on a supermarket authorised list wholesalers can run the risk of being fined for supplying us unsolicited. We also have to be honest and say that in times of strict budget control we cannot afford to waste our print copy. We have used any spare capacity to target new audiences at conferences, festivals and meetings. Our best route to market is through the independent retailers who we work with most closely in all our promotion work. Working with the wholesalers we try to maintain supply at shops six days a week if a copy is sold on any day. We also try to work on a plus one sale whereby if a retailer is selling one copy a day they also have one for display. However, after testing the market for a while if the copy never sells we do eventually move it. Due to the low volume of copies that we supply very few retailers are going to give us the most prominent, full-face place on their displays and the Morning Star, therefore, will often be found on the bottom plinth or mixed in with local papers. As I wander around shops I have been known to move our title to a more prominent position especially later in the day when space is available. We do have a number of trading agreements with multiple retailers such as Martin McColls, One Stop and GT News. These retailers should have at least one copy of the paper in each of their outlets. Check out the store locators on their web sites: www.mccolls.co.uk/, www.onestop.co.uk/store_locator.php andwww.gtretail.co.uk/storelocator.aspx. Knowing that the paper is available at these retailers is useful if like me you are on the road for work and do not necessarily buy your copy of the paper at the same newsagent every day. If after checking these websites you find that where you might be travelling to isn’t conveniently placed to these retailers do drop me an email with a few days’ notice and I will always try make sure that we can find you a stockist. Several of our readers contact me regularly to increase the supply of the paper at their local retailer on days that they are attending meetings and they sell on these extra copies. It’s a great way to support the paper and to introduce new readers. The newsagent will often put the order through but it’s good to inform me so that I know that the order has been processed. 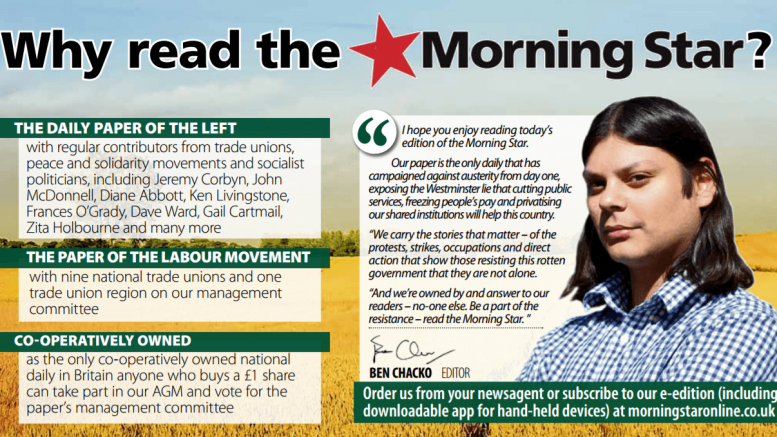 I would like to thank all those who we work with us in the newspaper trade for the support that they give the Morning Star. We are the smallest national daily title yet the professionalism of those who facilitate us within the wholesale and distribution trade is second to none. And to the happy band of activists who constantly promote the paper in their local area I thank you one and all. Be the first to comment on "How To Get Your Daily Paper"